“Akimbo is an ancient word, from the bend in the river or the bend in an archer’s bow. It’s become a symbol for strength, a posture of possibility, the idea that when we stand tall, arms bent, looking right at it, we can make a difference. If you don’t know Jordan Spieth, he is a prolific young golfer who has won three majors and been atop the world golf rankings more than once. He’s 24. By all accounts Jordan is a stand-up guy and surrounds himself with an equally grounded “entourage” – his ninth-grade science lab partner, a one-time high school basketball team manager, a junior golf nemesis from Kentucky, his sister who has special needs and his caddie who is uniquely qualified by virtue of his previous stint a sixth grade teacher. To unpack that through the lens of school, what do you think drives Jordan and other people to want to master something so badly? Flynn McGarry first demoed his cooking skills on the Today Show when he was 13. Today he is 19, and has me writing down ingredients for a delicious looking braised pork lettuce wrap. He did not speak or behave like many 19 year olds I know. I suppose that demeanor is earned when you open your own restaurant in NYC at the age of 19 and can fill it while charging $150+ per plate. Wait, what?? I was eager to learn more of the backstory for this “kid”. As educators, do we really care about the recipe – the process – or is it more relevant to focus on something that “tastes good” – a well crafted product? On staying motivated and working hard, Flynn attributes his work ethic to “never really being satisfied with himself” and continually trying to get better. In other words, just as Jordan Spieth described, mastery is not achieved after one or two big successes, but is a drive for continual improvement. Kaizen; if you will. Does an assessment system that grants an “A” inadvertently communicate a student has “arrived” or mastered something? Can grade levels and mastery coexist? Should it matter when mastery is achieved or simply if it is achieved? Ten years ago Jamie and Behan Griffin quit their high paying jobs and set sail around the world with their three children. That means that the kids – now 10,16 and19 years old – have missed ten years of formal schooling. Can you imagine?! Are they literate? Do they have friends? Will they get into college? The short answers are yes, yes, and yes (the interview is worth a watch for the details). In fact, these kids note missing things like bagels and a washer and dryer more than prom or riding the school bus. The oldest, soon heading to Lewis and Clark College (of course!! ), remembers life before the boat which he describes as “routine.” Now he has visited places he had previously only read about in books and “it is hard to describe because [visiting] is so much better.” I’m not advocating for doing away with school altogether – of course not – nor am I advocating for this particular example of a rather extreme vagabond lifestyle. However, it did make me honestly reflect on what experiences within school make it worthwhile. What is school’s – in the generic sense – unique value proposition if the Gifford family have shown alternate (maybe better) experiences for learning, making friends and still moving on to meaningful lives and careers? I’m fascinated by the day-to-day life for the Giffords. There is lots of play…LOTS of work (spearfishing, grocery shopping, laundry, boat maintenance, etc), AND a field trip of the day. The kids started off with more structured school curriculum, but that evolved into a more experiential learning based on whichever historical or cultural site was nearby to port that day. How can it be that these kids are learning at a presumably reasonable rate, but with only ONE field trip a day?! Compare that to most school days I know that move in and out of 4,5, or even 6 discrete subjects a day. What might be that ONE field trip a day that teachers could design/host/embark on that would “match up” or exceed current learning expectations? If I knew then what I know now, I would have been able to see the inquiry, experimentation, and fabrication that went into those works. Each artist was incredibly capable of landscapes, portraits, sketched figures, etc, yet they chose – with purposeful intentionality – to create the works masterpieces above. Rothko’s work reflects inquiry into how color can can affect behavior and moods and consume the viewer. Pollack experimented tirelessly to challenge the status quo of painting on an upright easel and instead explored a technique that allowed paint to meet canvas from multiple dimensions. Pras piled a bunch of trash in a way that…seriously…I don’t care who you are…that is awesome. He fabricated something from nothing while exhibiting extraordinary craftsmanship. Hmmmm..starting to sound like our Maker|Design|Engineering culture. Years later, I hope I’m a little wiser and find myself leaning increasingly more on the art world for inspiration not just from a creativity standpoint, but on pedagogical one. I’m desperate to learn more about how to cultivate creative thought and action AND assess and provide feedback in a way that cultivates our value standards for Maker|Design|Engineering at MVPS. Below is a sampling of segments from the book that seem to directly align with our value and process standards for Maker|Design|Engineering at MVPS. I hope that readers (that’s you!) will comment on what they like, what’s missing, and how they might translate to their own classrooms or places of work. Steve Jobs said that “you can’t connect the dots looking forward you can only connect them looking backwards”. I’m at a place where I’m committed to the idea that self assessment a-la the art studio model should be considered an increasingly valid and reliable method of assessment especially for domains like art and design that are rooted in creative thought and action. I genuinely want to invite this reader community to engage in some discussion to help me connect some dots. Time flies when you are having fun! I launched the Technology, Engineering, and Design (TED) course 2 years ago. The curriculum, my teaching style, and the space(s) have changed significantly since then – largely in response to my students’ feedback. Because TED is a one semester elective, I have had a chance to test 4 prototypes. I’ve tried engineering themes (GIS, Environmental Engineering, Product design). I’ve tried different projects (architecture & construction, bike redesign, furniture design & fabrication). I’ve tried different assessment strategies (a magazine/portfolio, project deliverables, standards based). Learning from those prototypes and iterations I feel like I have finally gotten pretty close to a replicable semester experience. That is saying a lot considering I have really enjoyed changing up content and themes each semester. The foundation projects were presented to students in the form of mini-design briefs (below). As the first round of projects wrapped up, it was fun to see the how the next group learned from the previous. One of the key hypotheses I continue to test is how projects evolve after students critique the builds from the previous group. The “exit ticket” out of one foundation build and into the next is 1) a clear deliverable and 2) honest critique and feedback on each other’s work. In particular, students are getting more comfortable with sharing their pHails. In fact, just 20 minutes prior to me writing that last sentence a student exclaimed “Hey we forgot to share my pHail today AGAIN! Can we be sure to do it tomorrow?” The craving of feedback with an eye toward helping next project iterations is a key element of the maker community we want to build. I think there are at least two reason why the pHailur (that just happened!!) culture has flourished this semester. Students have generated empathy for users of assistive technology. Regarding the latter, empathy for a variety of users has been generated largely through a partnership with Georgia Tools for Life – a non profit dedicated to testing and delivering assistive tech to people in need. GaTFL hosted myself and Trey Boden at their offices where we were able to ask if they would serve as both inspiration and outside evaluators for our students’ work. Following that visit, our students were able to visit….virtually…using a piece of assistive technology called a VGo telepresence robot. Driving the robot around from our own school was an empathy exercise in its own right, but the real “aHa” moment was a tour of the seemingly endless wall of assistive devices – each with it’s own story of how it made someone’s life easier – more independent – with restored dignity. In reflection of how things are going, I’m pleased. That is not to say that things are perfect. I will continue to iterate my instruction, but for the most part the culture of design and making that I hope to cultivate is taking shape. Students are coming in early and staying late, presumably because of their perceived shift from projects to purpose. How might we remind our community that we are all makers? How might we make students’ creative ideas tangible? How might we design a space that invites creative and industrious behavior? How might we create a space that communicates our culture of making? How might we make a learning space that is magical. Industrious. Buzz. Collaborative. Transdisciplinary. Shared purpose. Shared learning. At MVPS we start with questions and divergent thinking. The how might we’s listed above are just some of the questions terms our team is wrestling with as we work toward creating our maker-community. We’re not designing maker spaces; we’re building a maker community. A maker space might be considered any space with the tools and materials to create – the art studio, the science lab, the writing lab, your kitchen. In that regard, there is nothing much special about a maker space. A maker community, however, requires more. A community includes spaces, identities, and an embedded culture. It was with the above brainstorm and galvanizing of language that informed the design of the physical space more than anything else. “Agency” is the workshop space where our community can fabricate their designs with wood tools, a Crawlbot CNC machine, Glowforge laser cutter, and various other material choices. “Platform” is our digital creation space with access to 3D printers, vinyl cutter, micro electronics, and workstations for CAD, animation software and more. “Joinery” is a common space that fosters collaboration, ideation, and assembly. Learning spaces that instigate our community to experiment with their ideas and explore possibilities through the lenses of Art, STEM, or Humanities are located at the center of the space. They are central to not only the space butto the ethos of continual experimentation and seeking of new understandings. Flexible space at the entrance to invite inquiry, research, and sharing of ideas with both internal and external experts. It is also space to hangout and manifest ideas. Hackers – those who (re)create for a purpose. Below are some “before” pictures of Bo Adams and I finishing clean up before construction. In January, we look forward to opening the HIVE and continuing the MVIFI design work of building our Maker, Design, and Engineering program. I don’t want to say I planned to fail, but I also don’t deny that I didn’t see this coming. This year’s major project for my technology, engineering, and design class (T.E.D.) is a prototype in more ways than one. 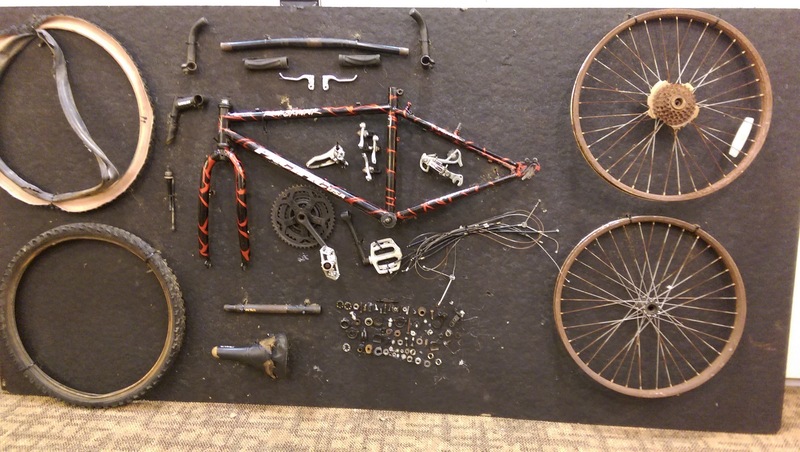 The Bike Project was born out of a generous grant from MVIFI’s XLR8 summer grant that was awarded to teachers proposing interdisciplinary PBL projects for the 2015-16 school year. The Bike Project is a collaboration between my T.E.D. class, AP Physics, and Algebra II. You can read my amazing colleagues’ – Robin and Zach – summary of the project on their blogs. From the beginning, the project was focused on testing the hypothesis that we could pull off meaningful interdisciplinary PBL despite challenges with class schedule, student age gap, etc. In other words, the focus of the project was on executing the PBL process and facilitating meaningful student experiences. We purposeful in our planning by using the Understanding by Design (UbD) model to ensure that the project would meet learning outcomes for our respective courses. [Here are the respective templates for T.J., Robin, and Zach that guided the project in our classes.] Who is going to argue with that logic? For the T.E.D. class, in particular, my goals for students were to 1) perform a functional decomposition (left) of a bicycle, 2) formulate design ideas based off of insights gained from interviews with bike enthusiasts, and 3) create a design brief that will guide future work on the project while demonstrating student teams’ ability to assess trade-offs and decision making. So what is the big #failup moment? Well…perhaps product is more important than teachers tend to let on? Reflecting back, I am more and more convinced that product and process are equally important. p[-[ I don’t mean to devalue the process by any means. That is where the learning happens. But the product – the thing – the solution – is why the learning happens. This project (for my class anyway) suffered from the age old adolescent question “Why are we doing this?” Point taken. There was excitement for the project and high levels of engagement early on, but the T.E.D students noted that too much time had passed between their initial “take apart” and conceptual stage and the time where new prototyping could happen. In the end, though, there never was a planned intent to actually fabricate the new bike component designs (focus on process, remember?). Last semester I had quite a different “engagement curve” with my T.E.D. class major project. In meeting Alex and 3D printing a prosthetic hand, my class and I made noticeable shift from working on a project to working for a purpose. You can read about that project in the MVPS Magazine on page 14 or watch the action here. On a global scale you might look toward Cesar Harada’s TED talk about the power of purpose based learning that is driven by a the creation of an innovation products. I got accepted into the Georgia Tech K12 inventure prize challenge! I’m so excited to be able to bring this experience to my students. The inventure prize is televised on GA public TV every year, and I’ve watched the finalist the last couple of years. I’m really impressed by the creativity of the Georgia Tech students that compete for the $20,000 grand prize. Some of my favorite designed projects were a biometrics app that only allows you to unlock a cell phone; a universal phone charger that folds into the sized of a credit card; a redesigned crutch; robotic dog toys; and this year’s winner the Safi Choo Toilet. This year’s winner was particularly cool because 1) it was social entrepreneurial in nature, 2) was designed by an all female group of engineers, 3) tackled an issue that may otherwise have been swept under the rug (toilet and water sanitation in refugee camps). The materials and training provided by Georgia Tech are fantastic and I’m most excited about students pitching their ideas to GT professors. We piloted something similar at our school last year and the high stakes environment surrounding the “pitch party” was really eye opening and beneficial for students. The suggested lesson plans provided by GT are an adaptation of Stanford d.School’s design thinking process. I feel good about that as I know that myself and my students are familiar with the process and have done several design challenges. The K12 challenge does not compete with the college level entrants (pheeew), but I’m still really anxious about getting started. The main source of my anxiety is trying to determine which group of students to invite to participate. My plan was to do it as part of my new Technology, Engineering, and Design course, but I’m nervous about adding one more thing on top of what I already like as a course design. I also could do it with my makers club, but because we only meet briefly after school once a week. I’m nervous this may not be enough time to “make a dent”. My essential question, then, is “Which best enhances student centered learning and creativity: work inside of class or outside of class (via clubs)? Are CTSOs like the TSA and FIRST Robotics an indication that the best student centered learning innovation happens outside of the classroom?